Yesterday I shared a theory that I loved—one that surprised me in a way gossip rarely does anymore. 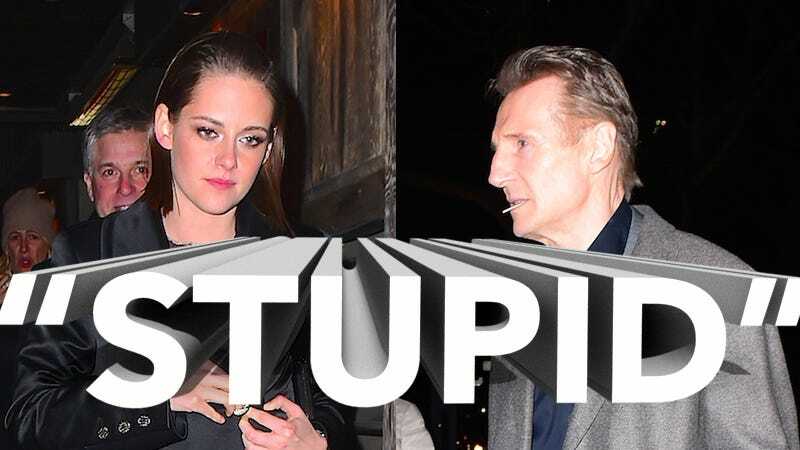 That theory was that Liam Neeson—Oskar Schindler, himself—is dating Kristen Stewart. As I said before, it was based on “almost nothing,” and as such, it has just been proven wrong. Liam may have been at Tao two nights in a row, but Kristen was only there once—for a NYFCC event Liam also attended. As someone who loves celebrity gossip, I disagree with Gossip Cop here. Who cares if the Mirror, a website notorious for being inaccurate, shared the news? The best kind of celebrity gossip is the silly, harmless stuff, and the Mirror should be overflowing with it. Give me less news about the Duggars, and more speculation about which mystery actress Liam Neeson is dating. Tell me something I don’t know, Liam Neeson’s rep. All of this is stupid. Is it rude of me to say Gwen Stefani is a little too old to be doodling hearts and using “4" in place of “for”? An autopsy reveals that Kristin Cavallari’s brother Michael died of hypothermia after his car broke down. There was no evidence drugs or alcohol in the car and the working theory was he was walking for help.